This one isn’t Valley specific, but oh well. I’ve spent several years walking around office hallways and cubos and overhearing people saying, “Let’s jump into a conference room and touch base”, or “My crack dealer and I are touching base at the street corner tonight, want to join?” and it has been getting to me. As far as I understand it, touch base == call or meet someone irrelevant about something immaterial. No one or nothing is being touched (at least I hope not). And whose base is this anyways? Why is there a base involved in the first place? Is anyone climbing a mountain? So why the hell do we keep using it?? “Touch base” is yet another example of corporate America’s slow but continuous emasculation and withering of plain, simple, understandable English. I only wish Hemingway were alive so he could get into a cagefight with anyone who’d dare to use the phrase in his presence. Now that’s a fight I would pay to watch on HBO. For an intro to the series, see here. While in India, my folks and I decided to take a family trip to Kerala, an absolutely gorgeous southern state in India. 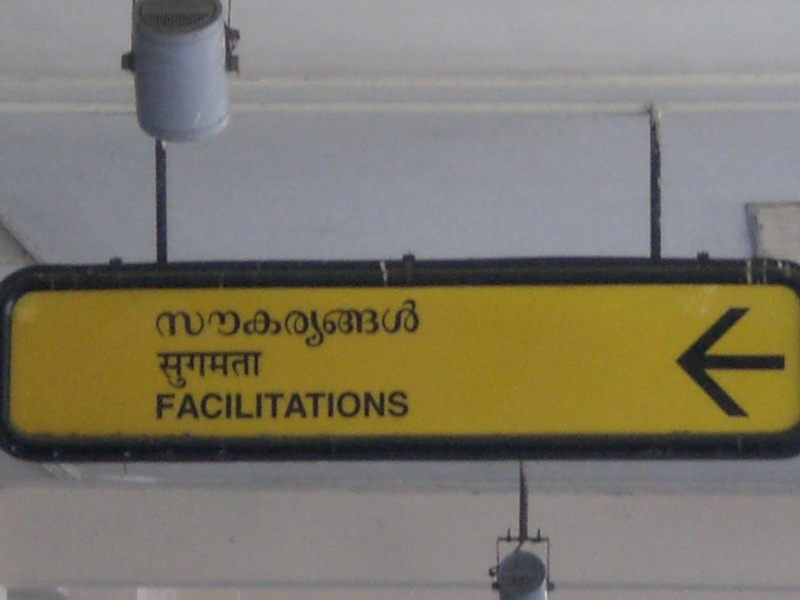 Kerala is full of wonderful cultural shocks and different from the rest of the country: highly educated, a heavy Christian population, lots of folks who don’t speak Hindi, greener than the rest of the country, the list goes on. This is not a sign that you will see at any American domestic airport. Questions: what exactly are they facilitating? If I walked in, would I see a helpful fella who would facilitate me by picking up my bags for free? Are they renting out elephants in there? What could it POSSIBLY be? I guess I could have just asked, but this is more entertaining. To me, anyways. How much does a well-respected blog translate into tangible benefits for a startup? Can a blog’s impact be measured in terms of valuation dollars? Trends and ideas related to the business of search. Kosmix is a player in the search ecosystem and these posts tell the world that we’re not a bunch of monkeys with a lot of VC dollars. It tells potential recruits, investors, advertisers and bystanders that we (or at least some of us) know what we’re talking about. It tells Stanford PhDs that we hire them for a good reason and that they’d feel at home with us. Posts plugging the technology that portfolio companies are building. A great way to give a fledgling startup completely transparent, totally biased but technically strong point of view. Details on conversations with tech heavy hitters like Peter Norvig. These depend upon the 1-2 punch of access that most of us don’t have and a degree of technical competence that most journalists don’t possess. Very unique, compelling content targeted at a niche audience of rabid tech heads. You get the point. His blog is an excellent mouthpiece for him as an individual and for Kosmix as a company. I now routinely run into people in Silicon Valley who don’t know Kosmix but have heard of Anand’s blog. That is absolutely shocking. Take another example: Marc Andreessen’s horribly brilliant blog that came out of nowhere with an absolute bang two years ago. Marc has publicly claimed (on his blog, where else!?) that he’d rather blog in his undies – stay with me here – than deal with reporters to plug his message. But these 2 guys are established Silicon Valley commodities. What of those who aren’t well known and/or don’t have a few million safely tucked away under a mattress? That’s what leads me to be most impressed with Andrew Chen’s Futuristic Play, a highly thoughtful blog on web monetization models, virality and other things that I don’t quite understand. It so happens that Andrew is doing a startup with a good friend from Stanford, so I’ve been following the blog for quite some time and watching it grow from nothing to over 3000 subscribers (yikes!). If I were a VC, I’d put some money into the guy. So the million dollar questions: how do you quantify this impact? If the value of PR is notoriously hard to measure in hard dollars, is this harder? And why hasn’t every founder/CEO in Silicon Valley gotten off their sorry asses and started a blog? Lastly, should I focus more on having a life than asking these questions? I recently visited my folks in India for three weeks. I hadn’t been back in years and its always fascinating for me to hang out in the land of my birth and adolescence. India 2008 is in so many ways so different from India 1999. But the best parts for me have nothing to do with India’s non-Hindu blazing growth rates. They have to do with the cultural differences that make themselves known in that most mundane manner: billboards, street signs, banners. Here is a fun example from my hometown. 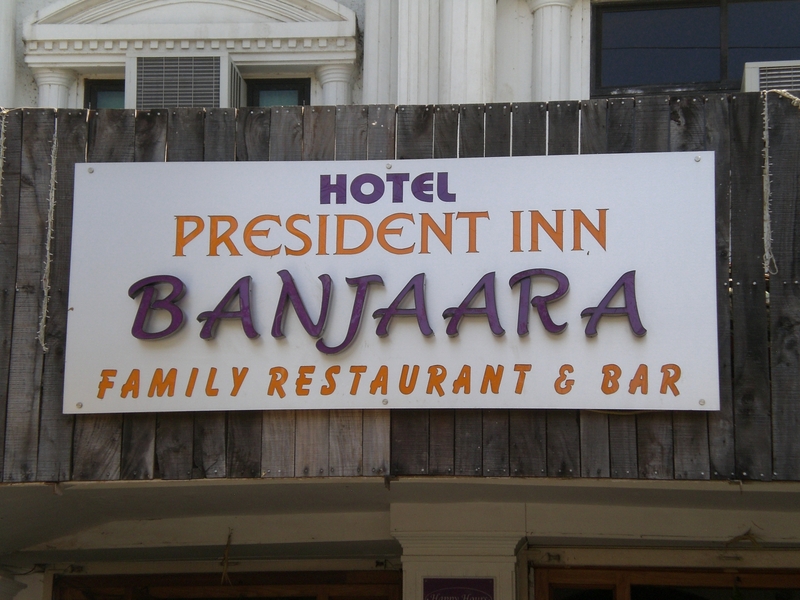 “Banjaara” – which means nomad for the uninitiated – is a little restaurant in my folks’ neighborhood. I already have an issue with the name; why name a RESTAURANT after people whose sense of hygiene is, well, nomadic. Why christen a place of good after people who move every time the sand blows in their face? But fine, I can deal with it. Here’s my real problem: these guys really can’t make up their minds! Is it a hotel? Or an inn? Is it a family restaurant? And if so, why is the word BAR prominently tacked to the end? And last but not least, why the gratuitous use of the word “PRESIDENT”? I know. I’m NOT supposed to be talking about Twitter. But this one is slightly subversive (as opposed to the normal blogger bitching about uptime, downtime, business model, blah blah blah). I found this great quote about Twitter on a – of all the places – Wired blog. “Twitter takes the Pringles analogy to its logical conclusion. It’s something like a collection of personal blogs, only each entry is limited to 140 characters, so you end up with a vertical stack of bite-size, artificially flavored communication snacks. They’re oddly compelling while remaining staunchly unsatisfying, and it always feels like maybe the next one will quell the roiling ennui inside.